During kindergarten, kids are starting to develop their foundation in math and in other subjects too. It is during this change that they will learn and master math for the rest of their academic lives. Simple addition and subtraction are the beginning of important math skills. A strong foundation can affect a child’s performance. The addition is the first skill learned in kindergarten and mastering this basic operation is the first step in appreciating math. Counting is usually the first math skill that kids learn. However, kindergarteners cannot understand the relationship between numbers and quantities. That is why addition can help them master the connection between the numbers and how they relate to one another. Children are being told about how challenging math can be. It is important to develop math skills at an early age so that kids can develop confidence and avoid getting scared of math. Simple addition and subtraction help children gain confidence and they can show the importance and usefulness of math in everyday life. This can instill a lifelong interest in math that can help students want to learn more and excel in their later years. Kindergarteners do not need to memorize simple addition and subtraction concepts in order to master them. Parents and teachers can instead use objects to demonstrate the concepts. Number recognition and writing, memorization of addition problems are both taught in kindergarten. These will prepare kids for elementary. Apps make a lot of things more convenient and easier. When it comes to learning apps for children, there are a lot of good apps out there that can help kids learn new things. Mobile apps are now becoming potent tools of learning for preschool, kindergarten, and even for more mature students. Mobile education is a fast-growing trend that is becoming widely popular. Multimedia makes learning more fun and interesting. The kids are engaged for a longer time and they are more motivated to learn. Interactive visuals are also helpful in stimulating a child’s interest to learn more about math. Technology allows learners to interact and experience various math problems with the use of games and other digital tools. Every person has a different learning pace. With increased access to technology, children can learn at their own pace without feeling left behind. Basic math facts can be more fun for kids. Flashcards may work but sometimes, integration with technology can help kids learn easier. 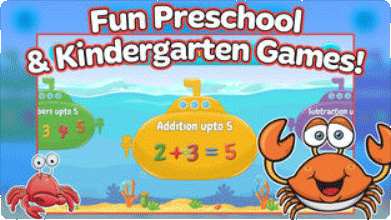 Below are some math apps that children can learn from and have fun at the same time. This app is good for preschoolers and kindergarteners since this focuses on number recognition, counting, shapes, color sorting, puzzles, and matching. This is a simple app that can be good for solo play. There are 11 fun-filled games that engage a child and at the same time teachers, about the various basic math concepts. The animal friends, funny sounds, and voice narration will surely keep kids entertained for a long time. This is another good app to teach math skills to kindergarteners. It focuses on basic math concepts such as addition, subtraction, and counting. It also focuses on sequencing, patterning, and number recognition. The app has a beach-themed world where the cute monkey guides the child through the game with wonderful animations for correct answers and redirection for incorrect answers. Kids have their interactive aquarium that can be filled as they collect prizes. Monkey Math School Sunshine has unlimited play. The game will continue as long as the user wants to. Moose Math focuses on counting, sorting, geometry, addition, and subtraction. There’s a part where progress can be monitored. There are 5 activities wherein each activity has its own levels. Kids can earn rewards to be used to build their own city and decorate buildings. Mathlingo is another interesting app that makes learning math fun. It has an ocean theme that is fun to interact with. This app includes basic math skills such as counting, addition, subtraction, geometry, and sequencing. Mathlingo has fun ocean animals that teach kids in an entertaining way. Addition and subtraction can be done with the use of pictures for easier learning. Children can learn from 1-5, and then up to 10. The goal of this app is to be able to pass through all the 8 levels within a certain time. There are 10 questions at each level and you have 30 seconds to answer. For every correct answer, 4 seconds are rewarded. The questions change every time so kids get a new set of questions every time they open the app. This is for 3 years old and up where students can choose four of the basic math concepts such as addition, subtraction, multiplication, and division. This can provide kids with lots of practice time. This app lets children experience different math skills such as counting, tracing, and reading numbers in a fun way. There are also exercises in this app such as addition, subtraction, patterns, and many more. 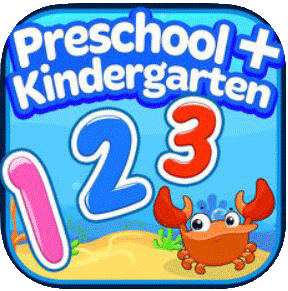 This is a counting app for preschoolers and kindergarteners. This app teaches the basics in counting using fun gameplay. Counting Caterpillar is an engaging way to build a good foundation in number skills. This is an engaging educational app with seven sections to choose from. Kids can learn basic addition and subtraction. Also included are counting and categorizing. Every page has a lot of things to explore and there are interesting interactions for every scene a child taps or touches. Children will learn basic math concept and the connection of numbers. This app teaches kids 30 math and reading skills. There are 50 lessons in the program that has a teaching moment that is followed by a set of educational games. Other skills to be learned that are included in this app are phonetic awareness, sight word recognition, and one-to-one number matching.